We're not yet finished with that Holyrood draft budget. Not by a long way. While you're busy doing the festive thing - or not - the legislation to enact it has a very short turnaround time for MSP committees to scrutinise the implications for their subject areas, reporting back to the finance committee by the middle of January. Others are busy too. The Scottish Fiscal Commission (SFC) last week rained on the finance secretary's budget parade with a dismal 0.7% growth forecast, and its senior figures appear in front of MSPs this week. Ahead of then, the Fraser of Allander Institute (FAI) has been digging into the 200-plus pages of SFC reckoning, and has come up with some interesting observations - some alarming, some less so. At a briefing on Monday at Strathclyde University, they highlighted that real disposable household income - that's spending power after tax and benefits - was forecast by the SFC to fall for the next five years. The Allander economists remind us that it's been falling for the past 10 years. We've never seen a period of stalled income as long as that - not in modern times anyway. While the growth figures are grim, it's reckoned that the revenue figures aren't as bad as they could be. The fiscal framework was a (largely incomprehensible) deal between Holyrood and Westminster, which determined the formula for the block grant, now that income tax is devolved. The useful element of it is that it protects Scotland against the effect of population growth being lower in Scotland than in the rest of the UK. That's a long-standing difference across the border, mainly due to migrants' preference for settling in London and the south-east of England. The other factor is that the increase in taxes, by £164m, is being used for public services. So while the increase in taxes can be expected to slow down the economy, a boost to public services can counteract that by helping growth. The result is that the draft budget's changes are either so small or so long-term as to make no difference to growth at all for the next five years. According to Graeme Roy, director of the FAI: "If the message gets out that Scotland is the highest taxed part of the UK, that is potentially more damaging than the tax rises". The Scottish government will have to work hard to get its own message across, he adds. Image caption Scottish ministers had called Financial Transactions funds in the UK budget a "con"
Financial Transactions are the element of grant from the Treasury in London that has to be paid back. You may recall Scottish ministers saying the allocation of £489m of funds from the Treasury to Scotland was "a con", as this wasn't real funding. They complained that it couldn't be used to pay for public services. Well, a month on, it's looking less of a con, and is coming in rather useful. In England, much of that money has been put into shared equity schemes for first-time buyers. In Scotland, it is being used in various ways, including £221m for housing. A significant part of it is to capitalise the Scottish Investment Bank. If that rings a bell, Professor Roy, a former economist within the Scottish government, reminds us that it's been announced at least four times in the past ten years. This time may be for real, however. Ring-fencing funds for repayment (over 30 years) means it can be invested in debt or equity in companies where finance is running short. The bank is to get £340m of capital, starting with £70m next financial year. There's a catch, suggests Graeme Roy - is that money actually adding value, or simply replacing capital that banks are making available, but which is not being used? For several years, the problem with business investment has been less about a lack of finance and more about a lack of demand for it. Firms haven't been drawing on the facilities they've had agreed, because of caution about the lack of demand in the economy. And that is one of the main sources of a lack of growth. A new fund, fuelled by tax money, might bridge some gaps in finance as high risk technology companies move to second or third stage funding rounds, but it may be harder to make a difference in the mainstream. On the spending side of the ledger, Allander's David Eiser has run the numbers on health and police - two areas of spending where the Scottish government has promised to protect spending, if not increase it in real terms. But at the same time as allocating an apparently generous deal for Police Scotland, Derek Mackay also announced a lifting of the pay cap, and a 'minimum guarantee' for those on less than £30,000. Implementing that means the uplift in police budget won't actually meet the uplift in police payroll cost. The National Health Service did a lot better. The £400m allocating for next year looks like a 2% real terms increase. But the experts reckon the NHS needs an extra 1% simply to deal with the increased pressure from demographic change - that is, an ageing population. If that takes out £200m of the uplift, another £170m will be required to meet that minimum guaranteed pay increase for NHS staff. For councils, the cost looks like £150m. Councils were reassured in the budget speech that they would get the same amount of funding as last year. That was in cash terms, so it didn't account for inflation. Nor did it take into account the cost of expanding the provision of childcare, and higher pay for social care workers. The Scottish Parliament's information centre (SPICe) has also produced its own budget analysis. This might help resolve political disputes about how to measure the funds made available. SPICe says total capital grants are up, by nearly 10%. It is the resource, or revenue, or day-to-day budget, for running services, that is the subject of dispute. Taking the general resource grant, plus the takings from business rates, councils have 2% less in real terms to spend on the services they continue to provide. That's £184m. They can gain more funds on condition that they spend them on Holyrood's priorities. If they do so, their budgets are down, in real terms, by 1.4%, or £135m. That's before they make decisions about council tax. Raising that by 3% could provide an extra £77m, in total - and that could wipe out the gain of £20 per year to lower earning tax-payers through creating a 'starter rate' of income tax. Image caption Will Scots in the 19p starter rate band be eligible for the married couple's tax break? Thanks to a contribution from the Institute of Chartered Accountants in Scotland (ICAS), it's worth noting that of those who could potentially pay income tax, 44% don't do so. Many of them are retired and on low earnings. A large number are the working poor, whose earnings fail to get to the £11,850 threshold next year. There's a question about accountability. With large numbers unaffected by income tax changes, it makes it easier for governments to raise more tax, without facing a political response. That's an issue of Westminster's making. In recent years, it has been raised the starting point for income tax from below £7000 - yet it has done nothing in parallel to raise the point at which people start paying National Insurance Contributions. ICAS also notes some anomalies that crop up through the dissonant systems for income tax north and south of the border and national insurance. It means earnings around £45,000 have a marginal tax rate of 53%, continuing an anomaly from last year. A new anomaly comes from the married couple's allowance, introduced at Westminster to meet a Tory manifesto commitment. It's worth £230 a year, and uptake on it is poor. The law states that it's only available to those on basic rate. 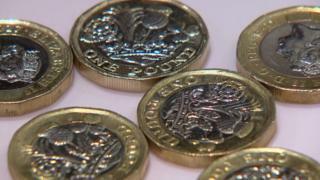 Yet for those whose earnings total between £11,850 and £13,850, on which the 19 pence starter rate will be levied in Scotland, they may not be eligible at all. Back to that issue of very low economic growth. The FAI economists point to a potentially significant policy move from the setting up of a strategic board, to oversee the role of Scottish Enterprise, Highlands and Islands Enterprise, Skills Development Scotland and the Scottish Funding Council, which puts government money into universities and colleges. The strategic board has been given the task of questioning whether money in that area - £2.4bn of it each year - is being effectively spent. And here's the challenge. If the board is being radical - and the state of growth in Scotland's economy suggests it should be - then it needs to question a few totems of government spending under the SNP. For instance, suggests Graeme Roy, is the Small Business Bonus Scheme worth all the money that's put into it, taking smaller business premises out of paying tax altogether? The Scottish Greens, expected to do a deal on the budget with the SNP, don't seem to think so. What of spending on universities and colleges? Is funding going to the right place? For instance, if you want to boost growth, are free student tuition fees the right place to put public money?